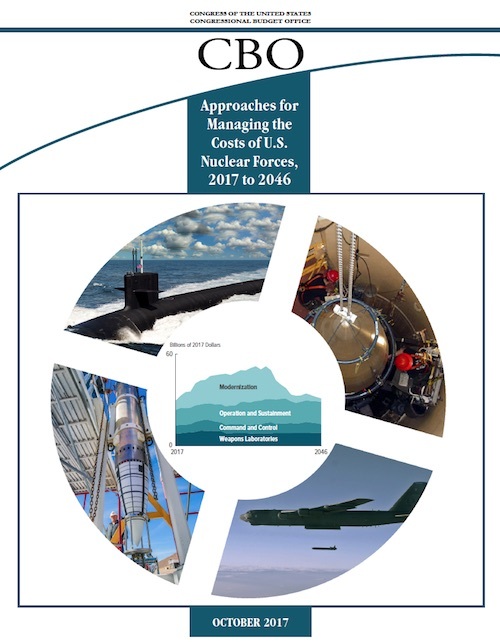 A new report by the U.S. Congressional Budget Office (CBO) projects that the current plan to sustain and modernize US nuclear forces will cost $1.2 trillion over the next 30 years – or $41.4 billion per year. A study by the James Martin Center for Nonproliferation Studies in 2014 projected the cost would be “over $1 trillion” over 30 years. CBO projected in February 2017 that US nuclear forces will cost $400 billion over the 10-year period 2017 to 2026, or $40 billion per year. The projection was a 15% increase over the $345 billion estimate from January 2015 for the period 2015 to 2024. Although the cost of US nuclear forces is limited compared with the size total defense budget, the cost will increase significantly in the next decade and compete with other non-nuclear defense priorities that also need funding. As a result, the current nuclear modernization plan is unsustainable. The CBO report therefore presents nine options for changing the nuclear force structure and timing that the Trump administration and Congress could consider for reducing the cost of nuclear forces. Over the past several years, government officials have warned repeatedly that the current nuclear weapons modernization plan is unsustainable. Despite these warnings, which are now being further substantiated by the CBO report, military leaders, lawmakers, and defense contractors have been relentlessly pushing the excessive “all of the above” modernization program under a false premise of a choice between modernizing or not or having a nuclear deterrent or not. These “all or nothing” arguments set up roadblocks to deal with the real issue. One “all or nothing” argument is that the United States needs to modernize, otherwise the nuclear deterrent will atrophy. But that’s not the choice. No one is arguing that the United States should not modernize its nuclear forces. The question is how much it can afford to modernize and for what purpose. Another cost related “all or nothing” argument is that nuclear weapons only cost 4-5 percent of the defense budget. Surely, the United States can afford that. But that’s not the issue. The question is how those 4-5 percent compete with all the other defense needs the taxpayers also have to pay for. And then there’s the “all or nothing” argument that the United States needs nuclear weapons, otherwise world wars will happen again. But that’s not the choice either. No one is arguing that the United States should unilaterally scrap its nuclear weapons. The question is now how the nuclear posture should be structured to best serve US national and international requirements in the decades ahead. If the White House, DOD, and Congress don’t make the right choices about priorities now at the outset of the modernization programs, future defense budgets will make the decisions for them. Those decisions will be much harsher: delaying, scaling back, or outright cancelling programs. The effect will be a nuclear posture in turmoil where the budget axe determines the structure rather than carefully thought out planning. The timing of report is impeccable (and FAS is honored to be referenced several times); only a couple of months before the Trump administration is expected to complete its Nuclear Posture Review. That review is expected to carry forward the bulk of the Obama administration’s nuclear modernization plan, possibly sprinkled with a few additions such as a new sea-launched cruise missile and a low-yield warhead option for one of the navy’s ballistic missile warheads. But that modernization plan is unsustainable. It would be irresponsible if the NPR reaffirms the current modernization program without adjustments to mitigate the funding threats raised by the CBO report. The CBO report includes plenty of options that the White House and Congress must consider for how to adjust the nuclear posture and the modernization plan to make it sustainable and still maintain a highly capable and survivable nuclear deterrent.